Where do you think I found these? How about these? What do you think they are? 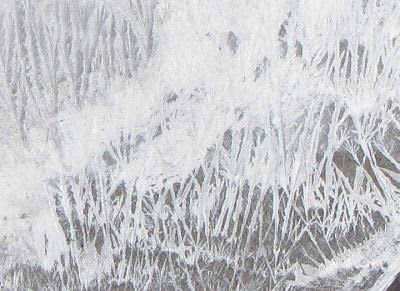 See the answer at Where Are We Today? Someone Wakes Up, but Who? 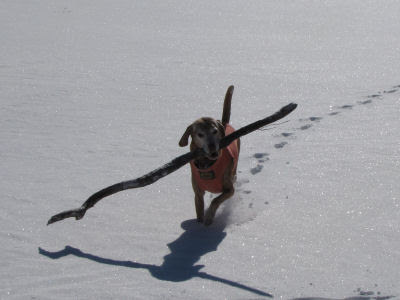 As Maggie and I took our walks today we found lots of evidence of a critter that hasn't been walking around during most of the winter. 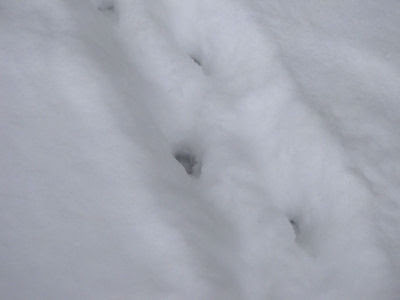 It's pretty hard to see any definition of the paw shape, or pad marks, or claws, in the soft snow. 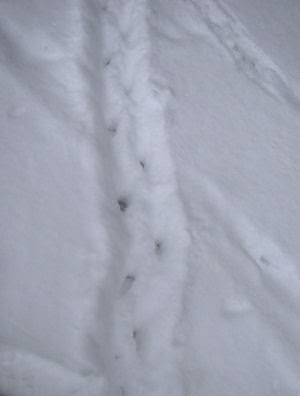 Learning tracks is quite a project, because any animal has several gaits, and conditions can make things look very different, too. It certainly felt like taking a considerable stroll. It wandered kitty-corner across about 50 acres of land. 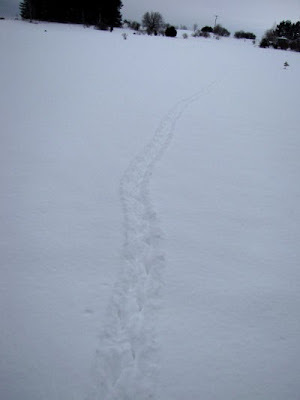 I have to confess that I'm not very certain of this ID, but it looks a lot like the raccoon one in my winter tracking book, so I'm guessing Procyon lotor, the ordinary raccoon. 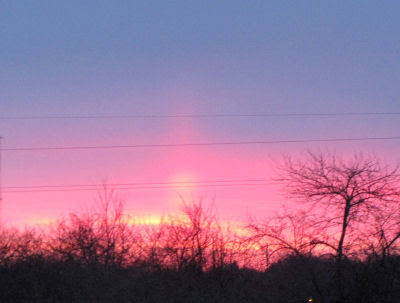 Just in case, for some odd reason, you didn't like the sun pillar in orange, I'm happy to provide you with one in pink. Yup... we had another one this morning. And I have a bit of an answer to the question about how long they last. This one, at any rate. I was getting a cup of coffee at 7:38 and looked out the kitchen window. I THOUGHT I was seeing the faint beginnings of a pillar forming, so I went and got the camera. I took my first picture at 7:39. The first picture I'm showing you was taken at 7:41. This was the tallest that the pillar rose, just a bit over 20 degrees (as measured by two hand widths). This is just a longer view, to put it in a bit of perspective. By 7:46, the sun was rising, and I really wanted to show how the ball of the sun was visible above the horizon. It's there, all right, but the brightness "burned out" the lens and made those "wings" of light. And yet, the pillar was still there. In another minute, it was gone. It didn't disappear all at once, but shrunk, becoming shorter and shorter and the sun got higher. 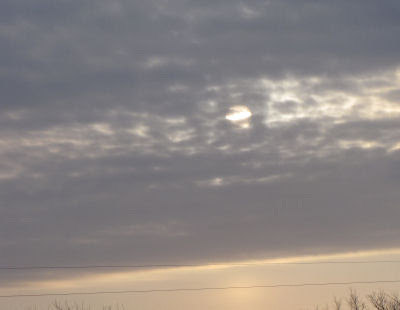 Oddly, by 8:17, the sun had turned so cold that it looked like the moon! Are you ready to write? I've let you off the hook for a couple of months, so it's time for some creative wordcrafting. I bet you can even guess what it might involve. You are so smart! 1. 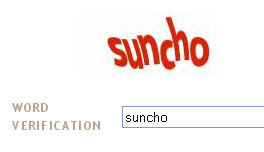 Choose two Captcha words. They can be shown together, or separately and you just like them together. You can use one of my samples, or find some of your own. It's not as if they are in short supply! The winner will be chosen by... YOU. I'll post the stories without the authors' names, on Tuesday, and you can vote for the one you like best! Today, I went out to do a couple of assignments with my job as a Field Data Collector. The road I drove was one that I've traveled many, many times in the past. But I'm trying to pay more attention to even familiar places. While double checking the topo maps, just to be sure that I knew what I was talking about, I learned that there used to be tiny settlement called Sauble. 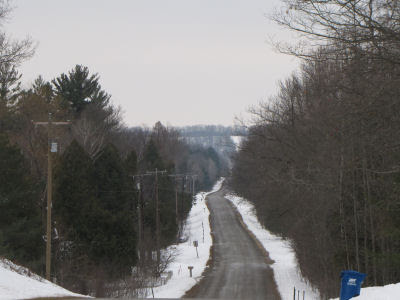 Actually, that is great info, because it gave me a way to tie these two pictures together, other than the fact that they are taken from the same road, Hamilton Road. This view is looking south. The hills in the distance are called Ward Hills. That might sound vaguely familiar, because it's a place that I like to hike. 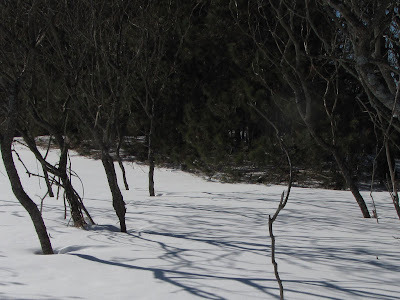 The hills are only a little bump, as hills go, but there used to be a small, family-friendly ski area there with just a rope tow. It's long gone. I never went there, and really don't even know exactly where it was. 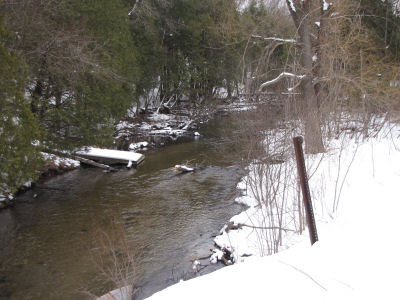 At the bottom of the valley between me and Ward Hills, is the Big Sauble (usually spelled Big Sable) River, and the corner that is all that's left of the hamlet of Sauble. Here's the Big Sable River approaching Hamilton Road from the east. Farther east, the North Country Trail crosses it on the Vince Smith Bridge. 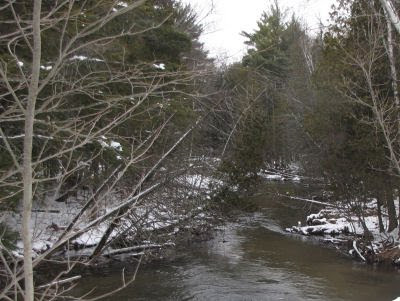 And here's the Big Sable River heading west toward Lake Michigan. The Big Sable doesn't get as much press as most of our other rivers, because it's not really navigable, even by canoe or kayak. This was fun for me... to try to explain to you how a little piece of what I saw fits into the local landscape. I hope you enjoyed it too. Where does Fairy Dust come from? 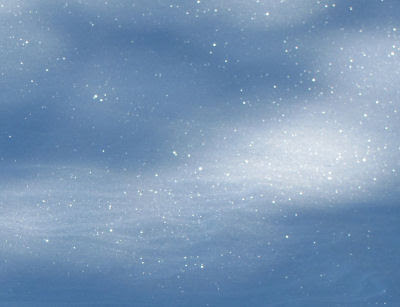 Fairy dust, pixie dust, Tinkerbell’s flying dust... We’ve known about that sparkling magic stuff almost since the crib. Few grown-ups understand: Sir James Barrie seems to be the first to have recorded the phenomenon, Elsie Wright and Frances Griffiths saw the fairies as children (but, of course, denied it as adults). But did you ever think about where fairy dust comes from? It’s quite a hard-to-find resource. It can only be mined on the coldest of days in winter, and is protected by the evil forest of Su-mac. It must be devined by a red-dog, she who wields the mystic rod and chases dust-bunnies to their lairs. Beyond the reaches of the shadows of the forest, where windows open in the rarest of winter suns, where no creature has even softly trod, lie the precious crystals. Shhh! The fairy miners must not be disturbed or they won’t be able to gather enough to last until next year. I'm sure you've heard the saying that when we plant a tree, we plant it for our grandchildren. Because trees grow slowly we rarely see the results of our efforts. 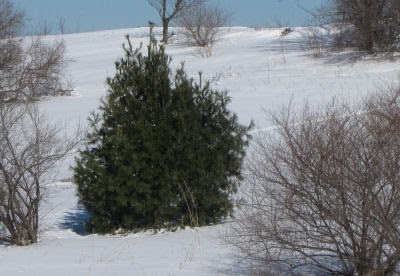 However, white pines grow quickly, as trees go. Take the one above, for example. I know exactly how long it has taken for it to reach this size. That's because I discovered it in 1992 when I ran over it with the lawnmower. So, 19 years ago, it was four inches high. Here's another observable growth. See where my shadow is pointed? Pretend that I could continue to walk straight ahead. Just two years ago, my trail- the path I mow- went between those two trees. Now, it would be a project to push through those branches. This news isn't so positive. This view from summer 2009 shows some of the babies back by the railroad tracks. The one on the far right is was the largest of the small ones. 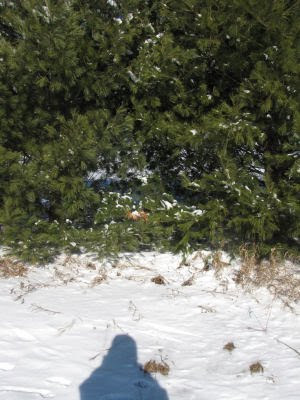 Deer will eat white pine in the winter, if they can't find anything better. 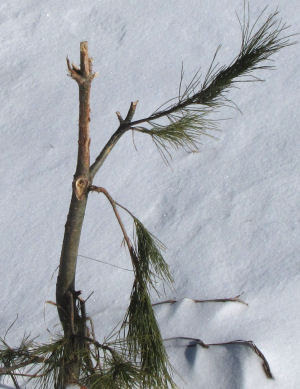 I haven't had too much trouble with this, but one of Bambi's cousins developed a taste for Pinus strobus this winter. I think it will survive, but it's certainly not going to be the lovely, healthy tree that it was for quite a few years. 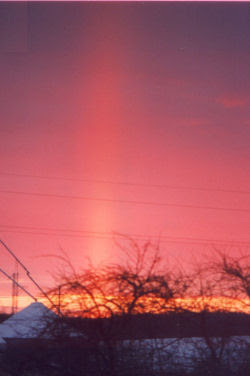 There were so many good comments and questions about the sun pillar, that I went hunting for that older picture. As you can see, I found it. I knew I had written about it before, and that was in December 2005. At that time, I was the web site manager for the North Country Trail Association, and did a near-daily news item. 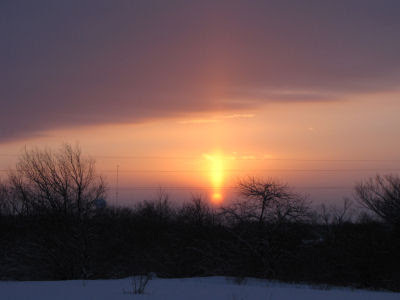 That morning, a friend wrote me that he had seen a sun pillar over Detroit. He described it as extending about 30 degrees into the sky. That was really unusual, as they usually are 20 degrees at the most. A quick and dirty method of estimating this is to extend your hand toward the sun. A handwidth is about 10 degrees. 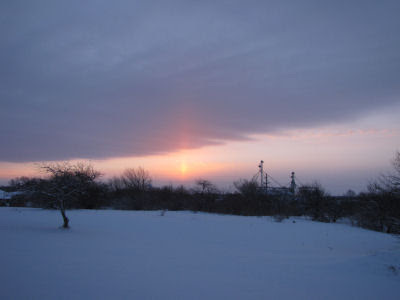 The picture today is a sun pillar that I saw from my kitchen window at sunrise on December 20, 1999. If you compare it with the picture from yesterday you will see how much taller this one is. I think it was probably also more than a 20-degree pillar. Yesterday's was just about ten degrees. Pillars take on the colors of the sun and clouds, they can appear white and at other times shades of yellow, red or purple. They can be seen both at sunrise and sunset. "My wife and I live in a fairly rural community and we see these "sun pillars" often in the morning when going to our jobs. It is probably due to the fact we both are driving east south-east directly into the rising sun and yes, it is during the colder winter months when we see them. They are awesome. We observe about a dozen a year. We'll even stop both our vehicles on a back country road on the way to work and observe them together and discuss how unusual they appear to be." These are not the same thing as Sun Dogs, although both appear as a result of ice crystals in the atmosphere. They only last for a few minutes, as far as I know. They are like rainbows, in the sense that they are simply a phenomenon of bent light (reflected for pillars, refracted for rainbows). Since the sun or moon has to be very low on the horizon for the angles to be right, as the light source moves, the reflection disappears. Thanks for so much interest in this wonderful event! Great atmospheric phenomenon this morning! Not the best one I've ever seen, but they are rare enough that I'm tickled pink anytime I can see one, and also photograph it. 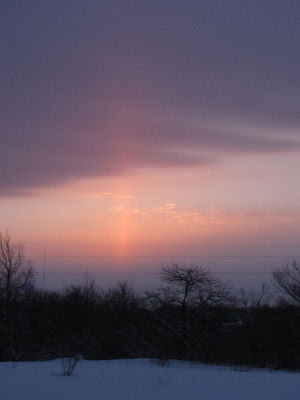 This is called a sun pillar. Actually, they can form in moonlight, or even from streetlights. I've never seen a moon pillar. Now that would be COOL! 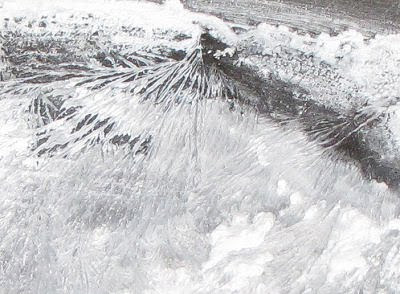 These are seen when the air contains flat, hexagonal ice crystals. 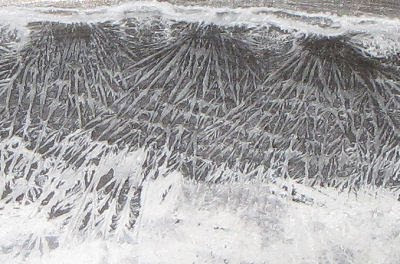 When the plates are larger than 20 micrometres across they tend to fall with their large flat side parallel to the ground, as if you dropped a dinner plate. (When they are smaller, they just tumble randomly). Because of the hexagon shape, they also tend to gather in formations, sort of like a flock of birds. 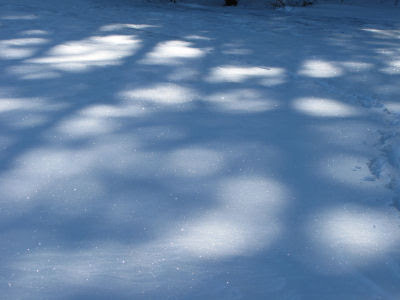 Light bounces off their edges and because of the non-random crystals, we see the light as a column. The light source must be very low in the sky for us to see the phenomenon. They tend to be short, but somewhere, from the past, I have a picture of a really tall one I saw once. If I run across it, maybe I'll use it for a future post. 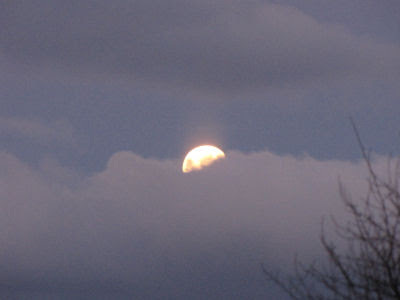 I glanced out the window at 8:30 this morning, and saw the full snow moon setting. I ran to get the camera, and by the time I got outside it had begun to slip behind a cloud bank. I very nearly missed it completely! I'm really sleepy- need to post this and hit the sack. 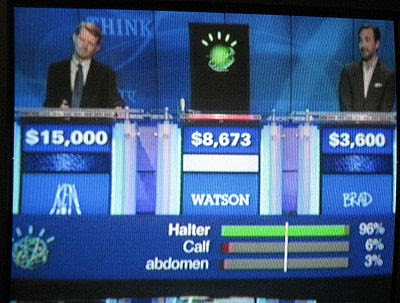 For the past two days, I've been talking about the historic Jeopardy match between Watson, the IBM computer, and Ken Jennings and Brad Rutter. One of the most interesting goofs that Watson made was in Final Jeopardy of the first of the two games. 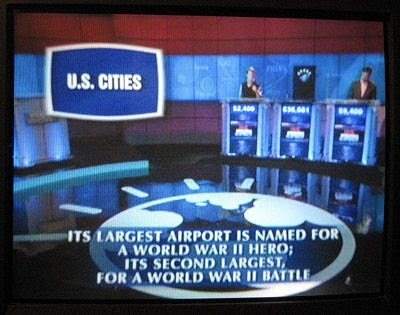 As you can see, the category was "US Cities," and the answer was "Its largest airport is named for a World War II hero; its second largest, for a World War II battle." If you haven't already seen this, you have 30 seconds to think of the question..."Da, duh, da, duh..." you know the tune. So how did you go about trying to figure this out? You might have started with trying to remember commonly-known names of large US airports: Reagan (Washington), Kennedy (New York), Ford (Grand Rapids, MI), O'Hare (Chicago), Logan (Boston), Armstrong (New Orleans). Then you might have asked yourself which of those people were WW II heroes. So now we are down to Kennedy, and O'Hare, maybe Ford. Grand Rapids only has one airport. What are the other airports in New York? LaGuardia- doesn't sound like a battle. What are the other airports in Chicago? Midway- there you go! 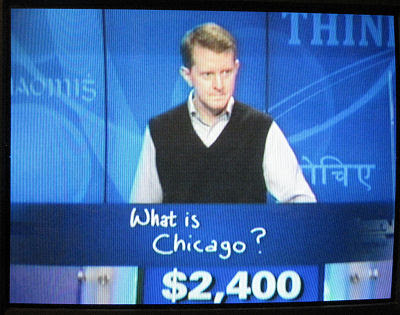 write fast... "What is Chicago?" 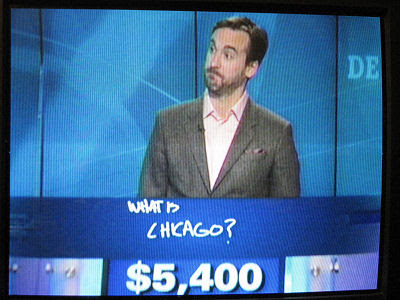 ... wrote "What is Toronto?" What?! Somehow Watson forgot to run his lists of comparisons against cities in the United States! But, it didn't matter. You would think that the machine would have had more self confidence, but it only bet $937. Phooey. So, it clobbered the humans, big time, in Game 1. This week will be remembered as another semi-mythical turning point in the historical battle of man vs. machine. Although John Henry, the strong man who beat the steam drill, won his contest, the hand laying of railroad track was soon to come to an end. The humans who battled the machine this week failed in their attempt to overcome. They probably lost, not for lack of knowledge, but for lack of speed. Have you figured it out yet? 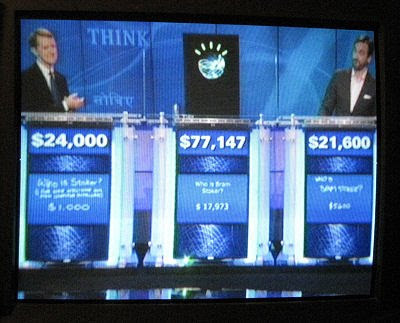 The IBM computing system, named Watson, went head to head with Ken Jennings and Brad Rutter this week on Jeopardy. This computer is really a room full of servers- about as many as would fit in ten refrigerators. It was designed and programmed by a large group of people over the course of four years. So... man vs. computer has happened before, particularly in games like chess. What is different about this contest? This computer uses a process more like true thought than the "brute force" method of determining the right answer. In brute force the computer simply calculates every possibility, and then chooses the one with the best outcome. Watson, however, operates in a completely different manner. If you watch Jeopardy you will know that every clue has at least two hints in it. First you have the category, then the clue itself. Very often the clue has two parts, or even a not-so-subtle hint in it (that is often a play on word meanings, if not an outright pun). The person who can correctly put all the clues together and fixate on the one question that fits all the parts of the answer, quickly, will get that question right. Watson read each clue, took each word, assigned a weight to the meaning (like throwing out "the") and compared lists of related words until it got a match between lists. It then assigned a probability of the selection being right, by comparing it with the total clue. If the probability of being correct was above 50% then Watson would ring in. We could see Watson's three top choices for each clue and its probabilities (note bar graph at bottom of above picture). This picture is the final scores of the two-game contest. Watson trounced Brad (all-time highest earnings on Jeopardy) and Ken (longest run of winning games on Jeopardy). Everyone seems to agree that this was primarily because Watson's reaction time to ring in was 1/100 of a second, not because it was actually smarter than the humans. There were some very funny moments- maybe I'll tell more tomorrow, especially if this obnoxious thaw keeps ruining my nice snow. But the truly historic part is that, like John Henry, Watson has been introduced in a manner that is not likely to be forgotten by everyday people. This is not just a gimmick. The computer is already being programmed to aid in medical diagnoses- not to take over a doctor's job, but as a way to look at more possibilities than one doctor can consider in a reasonable time frame. Like the steam drill, computers like Watson are here to stay. Hammer be the death of me." Leader of a steel-drivin' gang. "Shaker, you had better pray. Tomorrow'll be your buryin' day." Gonna whup that steel on down." I'll beat that steel drill down." He hammered his self to death. There lies a steel drivin' man." Just a little bit of explanation- This song describes laying railroad by hand. the Shaker was the title of the man who held the spikes for the driver. If the driver missed with his sledge hammer, it could definitely mean severe injury or death for the shaker. John Henry was a real person, the kernel of this story is true. The C&O Railroad was drilling a tunnel through Big Bend Mountain in West Virginia. The song sometimes refer to drilling of the tunnel, or sometimes to the number of feet of rail laid. Supposedly, John Henry drilled 16 feet in a 12-hour shift, while the steam drill only made 9 feet. However, the next morning, John Henry was found dead, the assumption being that the effort had killed him. He's supposedly buried near the Big Bend Tunnel. Do you know where I'm going with this story next? Come back tomorrow to find out. Meanwhile, enjoy this pre-Guthrie (think: before folk music was commercial) version- it loads slowly- turn off your sound, let it load, then come back and hit replay. Rose, at What I Made Today, has been driving me crazy! 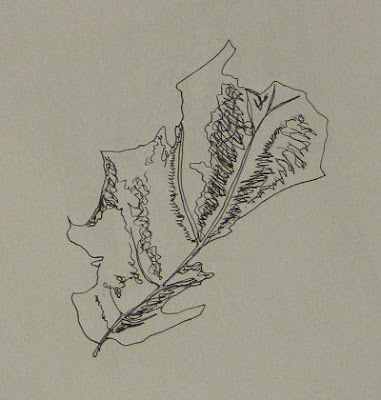 She draws things- just sits down and doodles and does it on book pages (which gives me the willies), and sometimes colors the drawings, and always just does them in a flash, and makes me want to do it too, but the engineering side of my brain says, "NO, you have to do it RIGHT." So today, Rose really, really made me crazy. 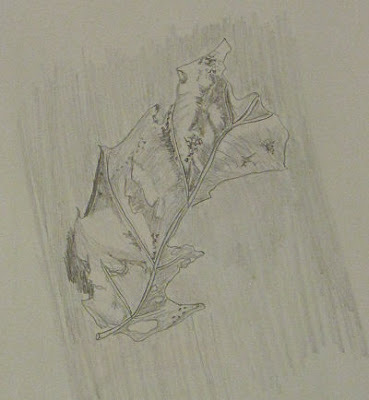 She cut up her violet patchouli soap and then a leaf blew in and fell at her feet. 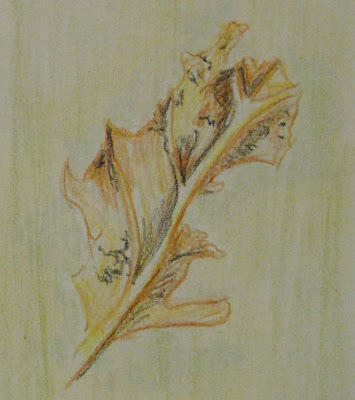 A lovely leaf. Go there and you can see it too. I had to draw it. I had to make myself draw it fast, because I only had this evening. I had to make myself draw it fast because I need to do that- to NOT agonize over every spot and tear. I made myself draw it with different "things," OK media. 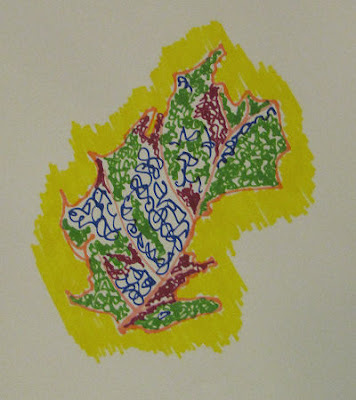 This one is just pen- but the rule was that I couldn't lift the point from the paper. I couldn't give in completely. I like pencil. I wanted to do a more realistic one. But I was sort of "good." I made myself do it fast. I like crayons too. Yup... ordinary broken crayon stubs thrown together in an old Albolene can. Finally... I tried to be crazy. Markers. Not so successful. But I tried. Just blame it on Rose.